Brendan Lillis is a prisoner who suffers from a debilitating illness known as ankylosing spondylitis. He is seriously ill; so serious in fact that those closest to him are of the view that he is dying. His partner informed a meeting in Derry a few evenings back that it was her view he that could be dead within ten days. Some sources within the Northern Ireland Prison Service are thought to be of a similar mind. If so it does not leave much time. Why Brendan Lillis continues to be held in Maghaberry Prison by British prison authorities for activity he carried out while a member of the Provisional IRA in the 1970s is understood but rarely acknowledged. The initial robbery charges that led to his life sentence licence being revoked in 2009 have since been withdrawn. There is no reason specific to him that would justify his continued detention. He is a pawn in a wider political game, one of those exceptions that proves the rule, British rule. Despite the ground that Northern society is supposed to have covered since the end of the Provisional IRA’s armed struggle, there are buried beneath that ground issues that few want to talk about; issues that were supposed to have been resolved by the new dispensation; issues that were red hot when the IRA campaign was in full throttle and were often cited as reasons that legitimised the use of arms. Consequently a man, whose energy and activity were ingredients in the fuel that drove republican activism forward, who was part of the arduous blanket protest, and whose investment in the republican project has been used to purchase the current political arrangement, is now banged up because of it. 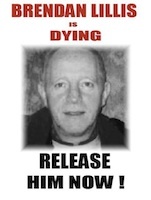 He is in the custody of the same prison service as before, being subjected to the same rights abuses as before, and seemingly being left to die, like others before. In blatant contradiction of its own guidelines outlined in its Corporate and Business Plan the Northern Ireland Prison Service is not providing Brendan Lillis with a health regime appropriate to his needs. Brendan Lillis is now reputed to weigh little more than 5 stone. He has been confined to bed for 600 days. He receives 40 tablets a day for his condition. The Life Sentence Review Commission has tried to postpone a date for a hearing of his case, meaning he is to be shackled to the system that is killing him that much longer. Each day that this grave situation is permitted to continue a little bit of Brendan Lillis dies. This former blanket protestor will emerge from prison one way or the other. The British Government knows it cannot hold onto him for much longer. But it seems confident it can hold onto him until such times as his case becomes the legal remit of the coroner. This is vindictive and born of mean spirit. Whatever about the political connotations interweaved with this case there is one very salient feature that cannot be suppressed. A very sick man is being held in prison and is likely to die there. The humanitarian grounds for releasing him far outweigh the political considerations that are feeding into his ongoing imprisonment. The party best placed to bring pressure to bear is Sinn Fein. Despite its claims to have been in the prison on seven occasions in the past year, its sole achievement is to have been in the prison seven times. It has produced little in the way of progress. In fact after its seven visits the situation if anything has deteriorated. It can get itself into prison seven times but cannot get Brendan Lillis out once. The party appears hesitant to go at the issue in a full blown and public manner because to do so would flag up that because of its failure to deliver substantive gains the British are still able to use a weapon of political policing to detain Brendan Lillis. And it is not that Brendan Lillis is being held for political views that he holds but as a warning to others as to what lies in store if they do not acquiesce. This is a demonstration of British political power over republican impotence. It is an in-your-face assertion that the big issues on terms of conflict related imprisonment were never settled but conveniently parked in the British favour. And in order to prove the point the British are prepared to fire a coffin across the bows of its adversaries.